Director Hunt mentioned two items (Conflict of Interest policy and Board Communications Protocol) were not shown on this agenda and did not want them to "fall through the cracks". Director Gregory commented that the two items are not forgotten but are pushed back due to work on the 2018 budget. Given that, Director Hunt moved and Director Hillman seconded a motion to approve the agenda for this Board meeting. Treasurer Gregory amended his Treasurer's statement in the July 10, 2017 minutes to read: "Treasurer Gregory reported the revenue from pool membership is presently $219,000, which currently projects a $38,000 loss from pool operations. This loss will decrease from additional pool membership income." He noted his Treasurer's Report for this meeting would provide updated pool information. Director Hillman moved and Director Friedel second the motion to approved the amended minutes. Before beginning the Member Voice section of the meeting, Director Nardella made a statement to the Directors that during this portion of the meeting Directors should be in "listening mode only". The purpose of Member Voice was to allow 3-minutes time for members to voice their opinions and concerns about Brandermill issues. If a member does not complete his comments within the time span, the member may submit his written statement to the Board to be included in the record of that Board meeting; or if an inquiry is asked, a response will be formulated and transmitted to the member, if needed, within normal business processes. He feels that recent meetings have allowed Member Voice to be converted into a townhall format which, he feels, is non-productive. Director Nardella acknowledged that some members feel their comments are not being heard and by adhering to proper procedures trust can restored in the Member Voice process. Director Pearson concurred with Director Nardella's comments and shared that the Board should be more receptive to opportunities for member input. For this latter reason, he feels the Directors and the General Manager should participate more fully in townhall meetings. Mark Smith (Cove Ridge), noting that he and his wife have lived in Cove Ridge since 1991, spoke about the shoreline adjacent to his property. The two photos below were presented to the Board. Commenting on Figure 1, Smith noted the photo depicted the shoreline taken from the back of his property, looking east toward Sunday Park. The black hand-drawn lines on the right indicates where a tree has been washed away. Figure 2 (facing west) illustrates the loss of 6' to 7' of soil along that same area. Smith stated that these losses were due to erosion. He invited the Directors to visit his home to view the area in-person, but more importantly, he would like to speak with the Directors and Manager Wright about possible erosion remediation. Present water quality of Swift Creek Reservoir is excellent. Chesterfield County has a 50-year plan to continue using Swift Creek Reservoir. Docks have no negative effect on the quality of water if proper building materials are used. The buffer zone must be protected and not clear-cut. Bob Malek (Regatta Pointe) noted that the BCA dock at Sunday Park is permanently attached to the buffer zone as is the deck located at the marina. To his knowledge, none of the residential docks are located in the buffer zone, and some, like his, have removable ramps to reach those docks. He cited that the 2009 BCA Buffer policy applied to structures located in the buffer zone. As residential docks are not located in the buffer zone, he claims the BCA has no jurisdiction over docks, and hence the ARB has no authority to approve or disapprove docks. The reservoir is presently 51 years old. There are no plans to cease the operation of the reservoir and its treatment plant. There are no calculations showing that the reservoir will not be usable in the foreseeable future. The reservoir continues to be an excellent source of drinking water. Wayne Goff (Bayport Landing) expressed his main concern was erosion in the buffer area. He has voluntarily installed riprap to prevent further erosion along his property. He also noted that the 24" drainage pipe located beside his home was clogged. A couple of years ago when he contacted BCA maintenance about this problem, he was told that the BCA budget did not allow for that clean-up and that the BCA would be required to obtain a permit from the County to perform the work. Goff personally took care of the clean-up himself. With regards to the docks, Goff has learned that the BCA has no control over the land at the bottom of the reservoir and hence no control over docks. Permission to have a residential dock is an arrangement to be made solely between the property owner and the county. He also feels that dock owners should be applauded as docks serve as erosion control devices. Bill Coiner (Cove Ridge) has lived in Brandermill for about 40 years and is a dock owner who does not feel that docks have any negative impact on our home values. He does believe that we need to protect and preserve Brandermill's assets for the enjoyment of current and future homeowners. Brandermill docks, both private and community owned, are not on BCA property, with the exception of our hard-owned docks which are on BCA property. The County has direct legal and regulatory oversight responsibility over docks and resource protection areas (RPAs). The BCA has co-responsibility with the County over the RPA. Of the 205+ Brandermill waterfront properties, 15 docks are permitted by the County out of an estimated sighting of 79 docks located south of the Genito area, not counting those located in other communities. There is no direct mention of docks in the Resident Design Standard which is used by the ARB in its decisions. There is no mention of docks in the general covenants or in the 2009 shoreline buffer policy. There is no final review ever having been completed by the County's Planning Commission on any policy relating to docks. Based on the above facts, First Vice President Nardella feels it is "imprudent in the least and legally dubious at best" for the BCA to consider any regulatory action or policy on the issue of docks. Available documentation limits BCA responsibility to the buffer area. Speaking for himself, First Vice President Nardella feels that we should all strive for the highest quality of water in the reservoir. He states that "while some have intimated that illegal docks, not permitted docks, are somehow the cause of water degradation leading to an eventual draining and repurposing of the reservoir, our County officials couldn't disagree more. In fact, the latest County report has determined that our water quality is the highest it has ever been." He further states that the County does not see discontinued use of the reservoir in the foreseeable future. In a recent meeting with County representatives from the Environmental Engineering Department (Weedon Cloe and Laura Barry), concerns were expressed about erosion in the buffer/RPA, pollution from construction occurring on the western part of the County, phosphates and runoffs. It was noted that all residents of Brandermill and the surrounding communities contribute to the runoffs and stormwater concerns expressed by these County officials. As Brandermill is located on the east side of the watershed, our community also suffers from wave action against the buffer, caused by prevailing winds. First Vice President Nardella feels that the BCA should address these important issues. County officials have agreed to walk Brandermill's shoreline and to suggest erosion remediation methods. As the BCA Board has been accused of micro-managing BCA operations, First Vice President Nardella moved that these concerns be addressed through regular order and that the Community Appearance & Maintenance and Planning Committees in conjunction with BCA Staff recommend a policy to the BCA Board for ratification. The recommendation should include consideration of best practices in preserving the highest quality of drinking water, aesthetics and affordability in the long-term, while preserving property values. Both Directors Hillman and Friedel seconded the motion. Director Gregory asked for clarification on the most important issue. 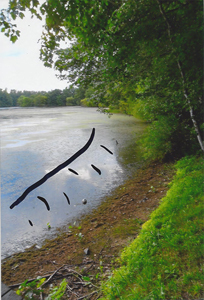 First Vice President Nardella responded that it was the erosion issue and reiterated that both County officials have agreed to walk the Brandermill shoreline with Staff. Director Hillman recalled the Board's approval for resident Roby to build a bulkhead to help curb erosion along his property. First Vice President Nardella emphasized that erosion control is a long-term project and has therefore included the Planning Committee. Director Pearson felt that this motion preempted the current agenda item to discuss the Swift Creek Reservoir shoreline. He commented that the discussion of the agenda item would not threaten existing docks but rather focus on how the disturbances within the buffer zone might impact water quality in the long term, i.e. normal filtration afforded by vegetation. 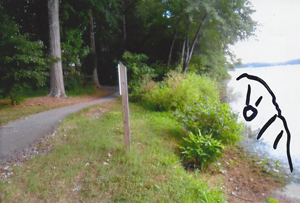 By walking our paths, members can see where residents have clear-cut vegetation down to the water's edge. Director Pearson wants to ensure that whatever occurs within the buffer zone is approved by BCA Staff and the County, and reiterated that none of the motions he proposes (see page 4 of dock material) dealt with the existing docks. First Vice President Nardella emphasized that the BCA has no authority/jurisdiction over the residential docks; that is something between the homeowner and the County. Director Pearson noted that in his communication with Cloe (see pages 5-6 of dock material), the homeowner needs permission from the HOA and underlying landowners. First Vice President Nardella asked if this was Cloe's opinion or if it was official policy. Both President Davis and First Vice President Nardella commented that this was not the time to discuss Director Pearson's dock material, as there was a motion on the floor. Both Directors Hunt and Hillman did not feel it proper to close the discussion. Director Friedel called the question. The vote was 4:3 (President Davis, First Vice President Nardella and Directors Gregory and Friedel voting "for" and Directors Pearson, Hunt and Hillman voting "against"). Director Hunt commented that she might have voted "for" if she had had the opportunity to get her questions answered. Treasurer Gregory announced that the Finance Committee had elected officers: George Lawson as Chair, Vicki Pavlova as Vice Chair, and Wayne Moyer as Secretary. Treasurer Gregory feels this team will provide great leadership for the Finance Committee and thanked them for their service. At the July Finance Committee meeting, it was agreed that the bad debt reserve remain at $109,000. Treasurer Gregory announced that his pool financial update is available online (page 1 of July 28, 2017 BCA Compass). With the best available information as of August 7, 2017, it is projected that the pools will show a loss of $22,000 this year compared to an approximate $83,000 loss last year. Referring to the financial statements, (see pages 22-24 of August 7, 2017 Board packet), Treasurer Gregory reported that income was approximately $198,000 over expenses. He also noted that although most of the pool income is reflected in these financials, not all of the pools expenses are reflected. Treasurer Gregory feels that the BCA is doing well with the overall budget and anticipates operations to be "in the black" at the end of the year. Director Pearson asked if line items 73 and 74 for Legal Fees (see page 24 of August 7, 2017 Board packet) could be further delineated. Manager Wright indicated that Controller Margaret Covington is presently working on the breakdown to reflect "general counsel," "elections," "property management" and "litigation". She noted that most of the overage in Legal Fees dealt with the Swim Metro litigation. Commenting on the Communications & Marketing Committee minutes (see page 48 of August 7, 2017 Board packet), Director Hunt asked that those minutes reflect four schools in lieu of the three presently shown. Manager Wright commented that a focus group is presently being organized so those things will be noted. Director Hunt was "blown away" with the fact that the Board just had a motion on the floor and a vote was taken before full discussion could occur. She personally feels that "cutting off" discussion was occurring way too often. Director Hunt noted that members attending Board meetings want to hear full discussion by the Directors as well as transparency on issues. Once a vote is taken, it is expected that all the Directors abide by the vote of the majority, and Director Hunt finds it increasingly difficult to abide by Board decisions when she is not given the opportunity to ask her questions. Director Pearson concurred. President Davis remarked that the discussion should have concerned the motion table, not necessarily with Director Pearson's dock material. Director Hillman felt there was no discussion on the Director Nardella's motion. She too felt that the discussion was completely and inappropriately shut-down. Manager Wright and Director of Property Management Al Raimo has reached out to Weedon Cloe to discuss the erosion occurring within Brandermill. A question posed by Manager Wright was the availability of grant monies to mitigate erosion, and it was determined that there might be some in the case of plantings. She also learned that up to 500' of riprap may be utilitized without getting permission from the Corp of Engineers. With the opportunity this year of levying more than 5% on 2018 assessments, Manager Wright felt it important to get all necessary information to mitigate erosion as well as to address any safety issues regarding our amenities. Regarding the comment about none of the existing docks being pulled from the water, Manager Wright clarified that it was a rumor; however, docks are not where the County's focus lies. Manager Wright announced several staff changes: Suzie Popielec has been moved into the Acting Manager role and Al Raimo into a Project Management position. The position of Director of Maintenance has been eliminated, and Pam Ettner, working with Charlie Cashion, will take over those responsibilities. Staff training continues to bring CAI standards into our organization. Manager Wright is currently working on the 2018 budget and agrees with Treasurer Gregory that we have a fine Finance Committee in place. She stated appreciation for Chair Lawson's leadership and discussed the budget timeline shown on pages 37-39 of August 7, 2017 Board packet. She called attention to the community meeting hosted by the Finance Committee on September 20 regarding budgetary issues and a possible second community meeting some time during the week of October 15. Manager Wright described her budget process as being slightly different, as she will first present a draft budget to the Finance Committee before presenting it to the Board. After discussing the draft budget with the Finance Committee, a proposed budget will be released to the BCA Board and Brandermill members via board packet. Given this year's opportunity to levy more than a 5% assessment increase, Manager Wright feels it important to properly address safety issues regarding our amenities. President Davis asked questions regarding NRC Chair Erin Collins' April 3 letter to the BCA Board in which Collins asked about snow removal: "Is maintenance of the road shoulders different from plowing snow, and does Rupert [our landscaping contractor] currently plow snow for Brandermill?" Manager Wright responded in the negative; VDOT has responsibility of the roads. In emergency situations, BCA maintenance has helped healthcare personnel by clearing those roads so they can get to work. President Davis commented that BCA does not clear roads due to liability reasons. President Davis also noted that in the same letter, a question was raised about the Harbour Pointe dock. Manager Wright commented that after a property inspection, it was discovered that there was no support under the Harbour Pointe dock. This created a safety issue, and thus the dock was removed. This does not mean that a dock at Harbour Pointe will not be addressed during this coming budget season. Referencing a letter dated August 4 from NRC Chair Collins, President Davis commented on the statement "... it was overwhelmingly apparent by show of hands that the community wants the Board to address" a number of issues. He noted that 46 meeting attendees only represented 3/10 of 1% of our total membership and asked Manager Wright if she felt this was representative of entire community. Manager Wright responded: "It's a small number." Director Hunt, who attended the August 4 NRC-hosted townhall meeting, felt that Collins' statement was accurate for what occurred at that meeting. Director Pearson commented that it was rare that the BCA Board had 46 members attend its meetings and asked "so what does that say?" President Davis queried whether 46 members represented consensus of the community. Director Hunt replied that it was sampling. Acknowledging that he did not attend the August 4 townhall meeting, President Davis felt that someone at the meeting implied that the BCA Board had sold land at the Harbour Pointe entrance for temporary County repair of the sewer line. This statement indicates that members are not understanding that the property in question was not sold but rather an easement/use was granted to the County. It was unclear to Director Hillman (who also attended the townhall meeting albeit late) as to why the easement issue was again being raised. Director Hunt stated that she continues to back her vote on that issue as well as the way it was handled. She believes the objection was over the word "perpetuity," that is, granting the County "perpetual" use of the easement. She feels it's now time to move on from that issue. Director Gregory noted that he tried to make it clear that the word "sold" should not be used in the granting of that easement. Director Friedel concurred that there is significant misunderstanding by the community of what transpired with the granting of the easement, i.e., no property was sold. Director Hunt believes that the issue was raised because the easement was discussed in executive session and voted upon in open session. This process left the members wanting more transparency. President Davis recalled the issue of sewer line rupture near Bone Fish Grill last year and the emergency action taken by the County to repair the line. Director Pearson asked about the amount of effort the BCA is expending to collect past due assessments. He noted that $83,590 or approximately 45% of total receivables was past-due for more than one year (see page 33 of August 7, 2017 Board packet). He asked if there were liens placed on accounts delinquent for more than one year. Manager Wright said the BCA would further elaborate on the collection of the delinquent accounts, adding that the State of Virginia allows a lien to remain on the records for 10 years. Director Friedel commented that a year ago, the total amount of delinquent accounts was well over $100,000. As advised by our auditors, the Finance Committee recommended and the Board approved appropriating the bad debt reserve line item to reflect those delinquent amounts. The BCA continues to work to reduce that amount. The timeline to finalize the 2018 budget is presented on pages 37-39 of August 7, 2017 Board packet. Please refer to the Manager's Report for discussion of this year's budget process. The BCA Board agreed to hold their September Board meeting on Monday, September 11 at 7 p.m. Location of this meeting will be announced later. Manager Wright anticipates having the draft budget for Finance Committee discussion on September 13. The Finance Committee has scheduled a workshop with the BCA Board on September 28. A community meeting will be held on September 20 on the proposed budget with a possible second community meeting to be held during the week of October 15. Prior to making a motion to enter executive session, Director Pearson noted that the Board had completely bypassed item #7 on the agenda (Discussion of Swift Creek Shoreline). The Board then voted to enter Executive Session. The NRC encourages residents to read the minutes of the various BCA committees found within this Board packet (pages 41-55). These committees are hard at work, planning not only this year's projects but next year's projects as well. Your feedback and participation NOW is important to them. NOTE: The September Board meeting is scheduled for Monday, September 11, 2017 at 7 p.m. Location to be announced..